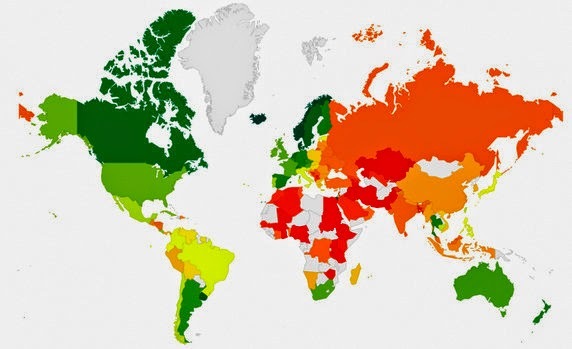 Where Gay Men Are The Happiest - Joe.My.God. Planet Romeo, an Amsterdam-based dating and community site, collaborated with the Johannes Gutenberg University of Mainz in Germany to carry out an online survey of 115,000 gay men around the world. They combined rankings on public opinion, public behavior and life satisfaction – how gay men feel about society’s view on homosexuality, how gay men feel they are treated by other people, and how satisfied gay men are with their own lives, respectively – into one worldwide ranking on gay happiness. Iceland tops their list as the country where gay men are the happiest, followed by Norway, Denmark, Sweden, Uruguay, Canada, Israel, Netherlands, Switzerland and Luxembourg. The United States ranks 26th in the list. The 10 worst countries by this ranking are Kazakhstan, Ghana, Cameroon, Iran, Nigeria, Iraq, Kyrgyzstan, Ethiopia, Sudan and Uganda. Hit the link and scroll down for the full ranking.